When it comes to kitchen remodeling, we have a very simple agenda “The kitchen should be aesthetically pleasing and functional at the same time”. DTLA Tile presents amazing kitchen remodeling in Los Angeles. Our team of experts has years of experience in all kitchen remodeling services including tile installation, tile backsplashes, countertops and cabinets. Our kitchen remodeling services include everything from brightening up the kitchen, installing tiles, installing appliances, replacing faucets and everything else you can think of. Thanks to our experience in this industry, our experts can help you estimate the total cost of your dream kitchen remodeling so you can get the best service within your budget. You can communicate your vision to our creative designers that could be either few quick updates or even a full overhaul. Why DTLA Tile for Kitchen Remodeling in Los Angeles? The year of experience in kitchen remodeling industry gives our professionals a unique advantage and we deliver the best outcome with highest possible cost efficiency without wasting resources (time and money both). The industry of Kitchen remodeling in Los Angeles offers anything you could possibly dream of. With DTLA Tile you can get the best tile installation and other remodeling related services under the budget; regardless of what your budget it. Of course you’d want to know beforehand how much your dream kitchen would cost; that’s why we offer free cost estimation. The estimation can also help you add/remove certain things from the design you have in mind. 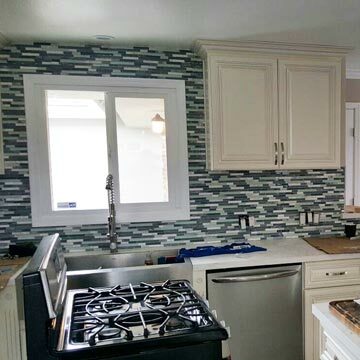 How Much Kitchen Remodeling In Los Angeles Would Cost? This is one of the most frequently asked questions and no doubt it is important too. People want to know how much it would cost to remodel their kitchen. Although our experts can help you estimate a highly accurate cost yet you can make a rough estimate yourself. Please note that the cost of kitchen remodeling depends on what things you want to add, remove or upgrade. Also, the labor of remodeling costs almost 25% of the entire budget in Los Angeles. Let’s see what we have learned about full kitchen remodeling in Los Angeles in last couple of years. The labor and installation cost almost 25% of the budget. Cabinets and hardware cost almost 30%. Tiling and flooring cost nearly 10%. Faucets and plumbing cost more than 5%. Lighting also costs almost 5%. Appliances and countertops cost nearly 20%. Of course these are rough estimations and you can adjust things according to your preferences. For example, some people prefer top quality tiles and tile installation services. We encourage our clients to research the topic so they can make better decisions about kitchen remodeling. The more they know, they more they can help us understand their requirements and the better kitchen they can design under budget. Let’s see some tips that can help you in redesigning and remodeling. That is a practical advice that we usually give to our clients; of course we would help you design your dream kitchen yet you need to consider your neighborhood too. Overspending or worse, under-spending is a real issue here. The cost of kitchen remodeling could be between $500 and $50,000. If you have future plan to sell the house, then overspending would be wasteful and under-spending would affect your house value dramatically. Every house in the world is built with a certain architectural design and class. Your kitchen must be compatible with that architectural style, otherwise it would seem odd. You need to work with that style, not against it. You need to ensure the kitchen belongs to your home, not someone else’s. Also, if a kitchen design is looking appealing in a house, it does not mean the same design would look great in your house. The kitchen designs have been evolving for decades and of course you need to keep up with the latest trends yet there are some basic things that you need to understand and follow. For example, appliances should be where they belong; refrigerator, oven and stove must follow a triangle shape. Similarly, the dishwasher should be right next to the sink, instead of on the opposite side or somewhere else. We understand you have installed very beautiful cabinets and countertops, but they would not look aesthetically pleasing without the proper lighting. This is one of the most common mistakes people make while doing kitchen remodeling in Los Angeles. Strategically positioned lights can beautify your kitchen dramatically. Feel free to contact us for design help, consultation, tile installation or anything related to kitchen remodeling in Los Angeles. We would be happy to help you.